Most Mac users cut, copy, and paste all the time. And most Mac users rely solely on OS X’s built-in clipboard—despite its obvious limitations. 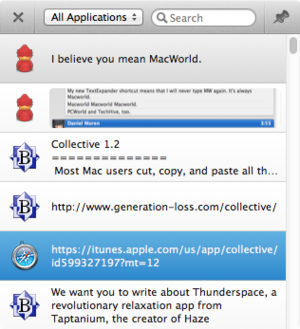 Collective 1.2 (Mac App Store link) aims to make the clipboard far more useful, and mostly succeeds. But it’s hampered somewhat by the Mac App Store’s sandboxing restrictions. Collective runs in the menubar, and it collects (get it?) everything you copy, in any app on your Mac—whether it be text, image, video, audio, or something else. When you press Collective’s keyboard shortcut, which defaults to Command-Shift-V but can be customized, a floating palette appears in the center of your screen, listing all the things you’ve copied to your clipboard, on an app by app basis. You can search across your copied text, or look specifically at content you’ve copied within a specific app. Then, you can use your keyboard or the mouse to select content you’d like to paste again. Once you’ve arrowed to the content you’re after and hit Return, or after you click on it... nothing obvious happens. That’s because the content you’ve copied is now placed on your clipboard again, meaning as soon as you press Command-V (or choose Paste from the Edit menu), your selected content is now pasted wherever you are. Without the Mac App Store sandboxing limitation, Collective could paste directly when you select the text or image you’re after; since the app is sold through the Mac App Store, you instead need to take the extra step of pasting manually. You can’t resize Collective’s window, though you can optionally choose to pin it so it’s always visible. If the snippet of text or cropped version of an image isn’t enough, you can press the Spacebar to Quick Look the copied content in question. While you can exclude apps (like password managers) whose copy history you don’t want saved, the app gets a bit flummoxed if you use a clipboard-dependent text expansion utility like TextExpander even if you exclude them; Collective’s clipboard history gets loaded up with entries from those background apps if you use them frequently. That said, if you’ve ever copied over something that you couldn’t get back, you understand the importance of a clipboard history. And Collective makes for a fine and simple-to-use one. Collective makes OS X's clipboard more useful.